CR-115. 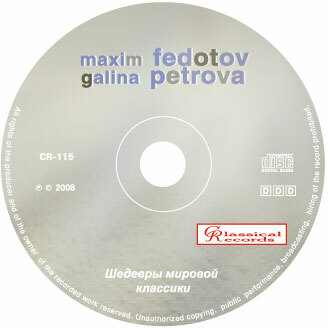 Maxim Fedotov, Galina Petrova. World classics masterpieces - Classical records - compact discs with classical music, CDs online shop. Maxim Fedotov is a Russian violinist, "Russian Paganini", "brilliant artist and perfect master" ("Frankfurter Rundschau"). Laureate and winner of major International Violin Competitions: in Tokyo, International Tchaikovsky Competition, Paganini International Violin Competition. Peoples' Artist of Russia, Laureate of the Moscow Government Prize, Professor of the Moscow Conservatory, Head of Violin and Viola Chair of the Russian Music Academy. President of the Association of Tchaikovsky Competition Stars. Gives guest appearances in the most prestigious concert halls worldwide. Performed more than 50 recitals and symphonic concerts at the Great Hall of the Moscow Conservatory during the last 10 years. Plays with all major Russian orchestras, with a number of European and Japanese orchestras. Performs with world famous conductors. The important part of his artistic life is occupied by performances and recordings in a duet with pianist Galina Petrova. Among his records there are also "24 Caprices" by Paganini ("DML-classics") and a series of CDs "All music for violin and orchestra by Bruch" ("Naxos"). Maxim Fedotov was the first violinist to perform a recital on two Niccolo Paganini’s violins - Guarneri del Jesu and J.B.Vuillaume (St.Petersburg, 2003). Since 2003 he is the principal conductor of the Russian Symphony Orchestra. Since 2006 he is the artistic director and principal conductor of the Moscow Symphony orchestra Russian Philhar-monia. Galina Petrova is a brilliant pianist - ensemble player. Her mastership is distinguished for "superb piano mastery combined with wonderful music intellectuality and artistic charm" ("La Voce del Popolo"). Merited Artist of Russia, Laureate of the Moscow Government Prize (2003). Soloist of the Moscow State Philharmony. Performs in all prestigious concert halls of Russia. Toured in Japan, Germany, Italy, France, Turkey, Croatia, Australia, China, countries of the Baltic area and others. Was elected to join Petrovskaya Academy of Science and Arts (St.Petersburg) as its Corresponding Member. Hold master classes in Japan, Croatia, Australia. Participates in major festivals and culture events - "Moscow Stars", "Russian winter", "Talents of Russia", "Stars of the Planet", Russian culture festivals in different countries. Took part in the "Millenium Concert" at the Grand Hall of the UN General Assembly (New York, 2000). Has made recordings for CDs released by "DML-classics", "Naxos", "Gold Club", etc. Galina Petrova is the partner of violinist Maxim Fedotov in all his chamber performances. Their duet is considered to be the most harmonious ensemble of our times. Critics call them "Musicians with temperament of a tiger", "the best Moscow duet" ("The Independent Newspaper"), "brilliant Russian virtuosos" ("Nice Matin"). Do you have any questions about CR-115. Maxim Fedotov, Galina Petrova. World classics masterpieces?